Standing on the beach with your toes in the sand and a few lines in the water can make for a really great way to spend a few days on the North Carolina coast or Outer Banks. 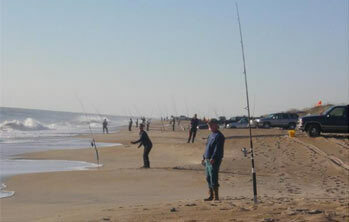 NC's Outer Banks has always been home to some of the best surf fishing around, but getting the inside scoop with a good surf fishing report before you start casting can mean the difference between a good weekend and a great weekend with a cooler full of fish. drop us a line if you see a good report we've missed.